Burn armor suffocates Dominik's heart! We are gathering money for urgent surgeries in the US! Goal: Urgent life saving surgeries for Dominik URGENT! 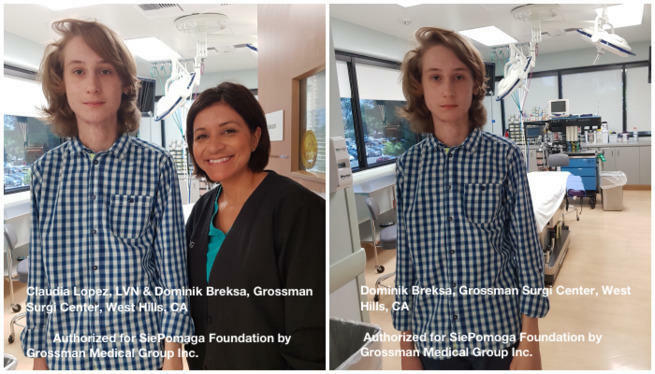 Mom: - We are begging you, our beloved Donors for a great thing - for support in surgeries saving Dominik's life in the United States so that he can live, stop feeling the chest and heart pricking at every minute movement and effort ... To be able to grow ... . Mom: - You do not have any skin on this surface. Your transplants are a big patch of kerchief, adhesions and hypertrophy ... You look like a larva that can not turn into a beautiful butterfly. 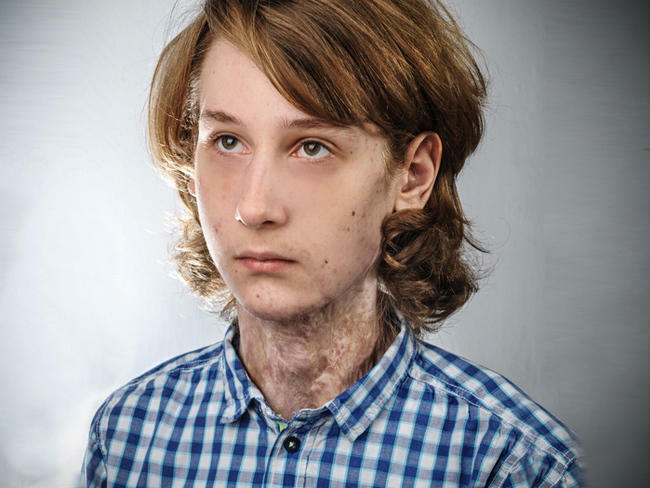 Dominik: - Keloids and adhesions do not grow with me. I'm experiencing a drama like being trapped in the armor, in the prison of my own body. I feel that I do not exist outside my body. Mom: - Do you remember another year of murderous rehabilitation exercises and massages that did not help? Dominik: - The series of pressure garments, ointments and special creams also did not help. Mom, I could not raise my head and see the sky ... or raise my hands and straighten my right elbow. I could not write at school. I could not do anything. Mom: - Then we got to Dr. Anna Chrapusty, who three times operated you in Centermed and the Rydygier Hospital in Krakow, Poland. Dominik: - The doctor tried very hard, but I still had horrible contractures and felt like a mannequin at the exhibition. I did not pass the cycling card. For me, there was no help in Poland. Mom: - My son, I remember that I promised you foreign assistance. Then, for the last time, we both cried dully all the way from the hospital to the house. Dominik: - The time between 2014 and 2015 was very intensive in West Hills, CA. Under the direction of Dr. Peter Grossman, MD, FACS, contractures in both armpits and in the right elbow were permanently removed with the help of artificial skin. The doctor repeatedly tried to loosen up my adhesions and keloids on the whole surface with steroid injections. Failed to. And then he invented giant tissue expanders for me, which he started to assemble me from various sides of the kelo ... Then I went through five surgeries. Dominik: - I believed that I would not be a mummy for the rest of my life. Mom: - A doctor from Gdansk also believed in you, the only one that we were looking for in all of Poland burn hospitals. The doctor who directed you to further treatment in the USA ... 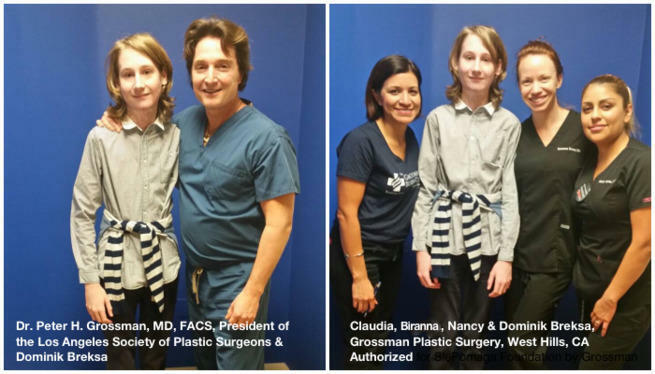 In 2016-18 the President of NFZ and National Consultant of Plastic Surgery in Poland they reimbursed you for further treatment at Grossman Plastic Surgery in West Hills, CA. Dominik: - Mom, why do we need 4.5 million PLN for my further treatment in the United States? Mom: - Sonny, a lot of surgeries before you. The new American program, which is unfortunately no longer refunded by the NFZ, provides for a dozen or so surgeries and other side procedures. Plastic surgery, especially abroad, can do miracles, but it costs a fortune. Dominik: - Mom, my life has no price. Mom: - Yes, Son. I want to dance with you rock-and-roll ... I want you to ride with your sisters bicycles "for racing." Dominik: - And I want to swim, Mom. For six years I can not enjoy anything, even water. I have still opening wounds in various parts of the burn. I do not want to fall into the chest of an 8-year-old child ... I am entering the high school .. Mom: - Thank you from the heart for every dollar/euro!